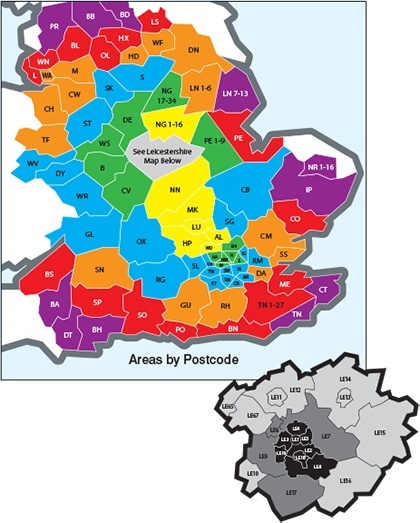 We operate a daily service (Mon-Fri) throughout the area shown on our postcode coverage map. Because we do not use an overnight parcel/pallet network we have control over your consignments at all times, to ensure smooth problem free deliveries or collections on our own fleet of vehicles. All goods carried under Road Haulage Conditions of Carriage 2009. A copy of which is available here. All consignments carefully collected and delivered using our own vehicles, not through a pallet network ensures maximum safe handling. You can specify an AM or PM delivery in Leics & yellow Zone A for an extra £20. Need a collection or delivery that’s not on the postcode map? contact us for price and options. We collect between 1500-1730 weekdays for delivery next working day. Need a collection bringing back to Leicester? We can help, the service works both ways. London Congestion Zone charges apply in Congestion Charge Zone. £10 Collection Surcharge applies in postcode areas LE6/7/9/17 – Areas LE10-16/65/67 additional collection/delivery charge applies. Prices correct as of April 2015. Fuel surcharges may apply.